A portion of the map, Gallia, from Butler's 1907 atlas showing the divisions of the diocese of Gaul in the late Roman Empire. According to the key, the map depicts 17 Provinciae Galliae, "Provinces of Gaul," of which the 17th, [Provincia] Maxima Sequanorum, "Greater Sequania," identified with an XVII shown in the Jura Mountains, contains the Sequani and Helvetii. Gold coins of the Sequani Gauls, 5-1st century BCE. 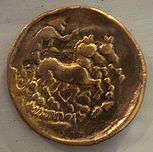 Early Gallic coins were often inspired by Greek coinage. Silver coins of the Sequani Gauls, 5–1st century BCE. A map of Gaul in the 1st century BC, showing the locations of the Celtic tribes. Sequani, in ancient geography, were a Gallic people who occupied the upper river basin of the Arar (Saône), the valley of the Doubs and the Jura Mountains, their territory corresponding to Franche-Comté and part of Burgundy. Sequani is an exonym assigned by the Romans, most likely based on a similar-sounding endonym. The endonym is not known for certain. Sequani is like Sequana, Caesar's name for the Seine, but the country of the Sequani is not in the Seine's watershed. Strabo was originally responsible for the folk-etymologic connection by supposing that the Sequana flowed through the country of the Sequani, a geographic error. The French name of the Saône, however, the river forming the western border of the Sequani, derives from Celtic Souconna. The Romans called it the Arar. William Smith hypothesized that Sequani and Souconna were related. The country of the Sequani can be defined by the reports of the ancient writers. The Jura Mountains separated the Sequani from the Helvetii on the east, but the mountains belonged to the Sequani, as the narrow pass between the Rhone and Lake Geneva was Sequanian. They did not occupy the confluence of the Saône into the Rhone, as the Helvetii plundered the lands of the Aedui there. Extending a line westward from the Jura estimates the southern border at about Mâcon, but Mâcon belonged to the Aedui. Strabo says that the Arar separates the Sequani from the Aedui and the Lingones, which means that the Sequani were on the left, or eastern, bank of the Saône only. On the northeast corner the country of the Sequani touched on the Rhine. Shield pattern of the Sequani auxilia palatina unit, according to Notitia dignitatum. Before the arrival of Julius Caesar in Gaul, the Sequani had taken the side of the Arverni against their rivals the Aedui and hired the Suebi under Ariovistus to cross the Rhine and help them (71 BCE). Although his assistance enabled them to defeat the Aedui, the Sequani were worse off than before, for Ariovistus deprived them of a third of their territory and threatened to take another third, while subjugating them into semi-slavery. The Sequani then appealed to Caesar, who drove back the Germanic tribesmen (58 BCE), but at the same time obliged the Sequani to surrender all that they had gained from the Aedui. This so exasperated the Sequani that they joined in the revolt of Vercingetorix (52 BCE) and shared in the defeat at Alesia. Under Augustus, the district known as Sequania formed part of Belgica. After the death of Vitellius (69 CE), the inhabitants refused to join the Gallic revolt against Rome instigated by Gaius Julius Civilis and Julius Sabinus, and drove back Sabinus, who had invaded their territory. A triumphal arch at Vesontio (Besançon), which in return for this service was made a colony, possibly commemorates this victory. Diocletian added Helvetia, and part of Germania Superior to Sequania, which was now called Provincia Maxima Sequanorum, Vesontio receiving the title of Metropolis civitas Vesontiensium. The southern reach of this territory was known as Sapaudia, which later developed into Savoy. Fifty years later, Gaul was overrun by the barbarians, and Vesontio sacked (355 CE). Under Julian, it recovered some of its importance as a fortified town, and was able to withstand the attacks of the Vandals. Later, when Rome was no longer able to afford protection to the inhabitants of Gaul, the Sequani became merged in the newly formed Kingdom of Burgundy. ^ Boardman, John (1993). The Diffusion of Classical Art in Antiquity. Princeton: Princeton University Press. p. 308. ISBN 0691036802. ^ a b Smith, William, ed. (1873). "Sequana, Sequani". A Dictionary of Greek and Roman Geography. Volume II. London: John Murray. pp. 965–966. ^ Caesar & BG, Book I, Section 6. ^ Caesar & BG, Book I, Section 11. ^ Strabo & Geography, Book 4, Chapter 1, Section 11. ^ Caesar & BG, Book I, Section 1. T. Rice Holmes, Caesar's Conquest of Gaul (1899), p. 483. A. Holder, Altceltischer Sprachschatz, ii. (1904). Mommsen, Hist. of Rome (Eng. trans. ), bk. v. ch. vii. J. D. Schöpflin, Alsatia illustrata, i. (1751; French trans. by L. W. Ravenèz, 1849). This page was last edited on 1 October 2018, at 20:56 (UTC).